"I died in Vietnam, but I didn't even know it," said a young Vietnam vet on the Today Show one morning in 1978, shocking viewers across the country. Waiting for an Army to Die: The Tragedy of Agent Orange—the first book ever written on the effects of Agent Orange—tells this young vet's story and that of hundreds of thousands of other former American servicemen. During the war, the US sprayed an estimated 12 million gallons of Agent Orange on Vietnam, in order to defoliate close to 5 million acres of its land. 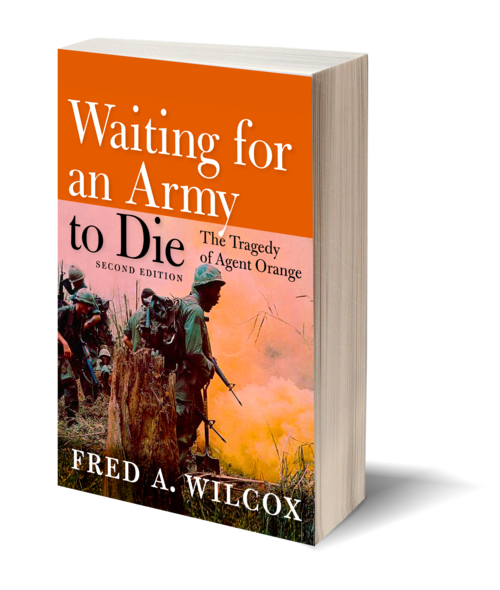 "Had anyone predicted that millions of human beings exposed to Agent Orange/dioxin would get sick and die," scholar Fred A. Wilcox writes in the new introduction to his seminal book, "their warnings would have been dismissed as sci-fi fantasy or apocalyptic nonsense. Told in a gripping and compassionate narrative style that travels from the war in Vietnam to the war at home, and through portraits of many of the affected survivors, their families, and the doctors and scientists whose clinical experience and research gave the lie to the government whitewash, Waiting for an Army to Die tells a story that, thirty years later, continues to create new twists and turns for Americans still waiting for justice and an honest account of what happened to them. 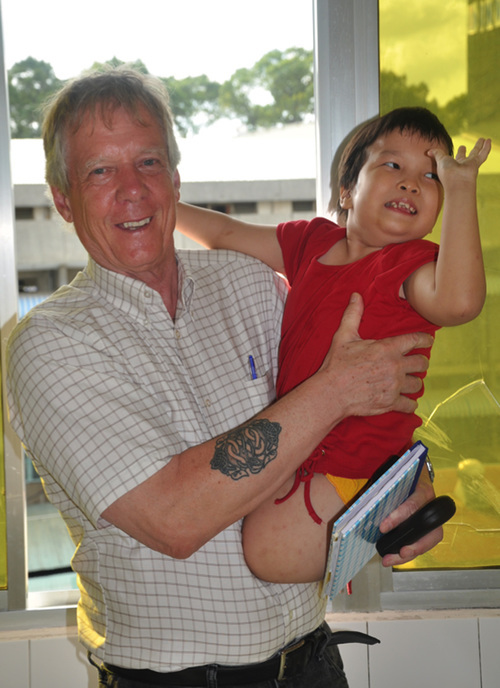 Vietnam has chosen August 10—the day that the US began spraying Agent Orange on Vietnam—as Agent Orange Day, to commemorate all its citizens who were affected by the deadly chemical. The new second edition of Waiting for an Army to Die will be released upon the third anniversary of this day, in honor of all those whose families have suffered, and continue to suffer, from this tragedy. (BIEN HOA, SOUTH VIETNAM, 1966)— The twin-engine C-123 Provider transports are loaded, the booms on their wings checked. There is no real damage to any of the craft from the hits they took the day before, and the crews are checking the coordinates, air speed, and other details of the day’s mission. They will be airborne before daybreak, flying south, then east, and after circling at high altitudes they will descend in tight formation to spread thousands of gallons of Agent Orange over a target approximately 8.5 miles long, with each plane covering a swath about 250 feet wide. Within the dense mangrove forests are colonies of Viet Cong who have struck at the surrounding countryside for years, only to vanish into an impenetrable stronghold. But the men who participate in Operation Ranch Hand are not always told what lies beneath the foliage, or what they are spraying. Their assignment is to strip away the enemy’s cover, flushing him into the open where, tacticians believe, he will be destroyed by American and South Vietnamese ground forces. Until 1970, when the Air Force suspends use of Agent Orange in Vietnam, the Ranch Hand team will fly hundreds of missions, destroying thousands, then millions, of acres of mangrove forests, jungle, and crops. Because of navigational difficulties, and the possibility of losing crew members when a plane is shot down, night flights have been ruled out. The slow-moving planes, skimming in broad daylight just 150 feet about the trees, make tempting targets to enemy gunners. The planes move in patterns similar to those one makes when mowing the lawn, forward and back until a predetermined area has been fully covered. Although a mission can be completed in three to five minutes, the Ranch Handers take many hits, making them among the most decorated veterans of the Vietnam War. Sometimes the C-123s spray around the perimeters of base camps, where shirtless men carrying tanks of herbicides on their backs now and then playfully spray one another, or Huey helicopters mounted with spray booms work and rework approaches to the base. Some of the troops complain of headaches that last for hours, even days, and skin rashes that cover their arms, necks, and faces. But no one collapses or dies following his exposure to Agent Orange, and the defoliated Maginot Line between base camp and jungle might mean the difference between life and death. The defoliation campaign, though a topic of casual conversation among the troops, is accepted as just one part of the overall effort to defeat the enemy.